SkillsUSA represented the United States as the WorldSkills flag, which is traveling around the world in advance of the next competition, made a stop in Atlanta March 24. 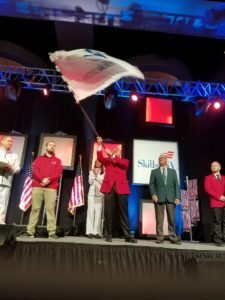 SkillsUSA Executive Director Tim Lawrence waves the WorldSkills flag on stage at Georgia’s state conference in Atlanta. Click to view full size. In each city where the international competition has been held, a patch is added to the flag. SkillsUSA executive director Tim Lawrence placed the U.S. patch on the flag to represent the organization’s 1981 hosting of WorldSkills in Atlanta. As with the Olympic torch, the flag relay started in Abu Dhabi, United Arab Emirates, during the closing ceremony of the 2017 competition. The flag was turned over to the next WorldSkills host city, Kazan, Russia. After arriving in Sochi, Russia, the flag was launched into space and kept on board the International Space Station for more than two months. Beginning March 12, the relay resumed in Madrid, Spain, with the WorldSkills flag moving to host sites around the world. Once the relay is complete, the flag will travel across Russia and the Republic of Tatarstan before being delivered to Kazan during the opening ceremony of WorldSkills in 2019. The Atlanta ceremony was held during the SkillsUSA Georgia High School State Leadership and Skills Conference. Participants included SkillsUSA national officer Scott Hicks from Georgia and former WorldSkills competitor Kieron Kohlmann, who is now an ambassador with the WorldSkills Champions Trust. Joining them were Joshua Whittington from Albany, Ga., a 2017 competitor in Mechatronics, as well as Terry Cook, a WorldSkills International board member. SkillsUSA team leader Heidi Walsh planned the details for the relay while Ashley Brown, director of SkillsUSA Georgia’s high school division, hosted the group and ceremony at her state conference. WorldSkills and Kazan 2019 representatives managed the relay process. This display of international cooperation focused on the power of skills, and career and technical education, worldwide.